Yup, you read that right. Gloria has officially become the first person ever in our family to break a bone. 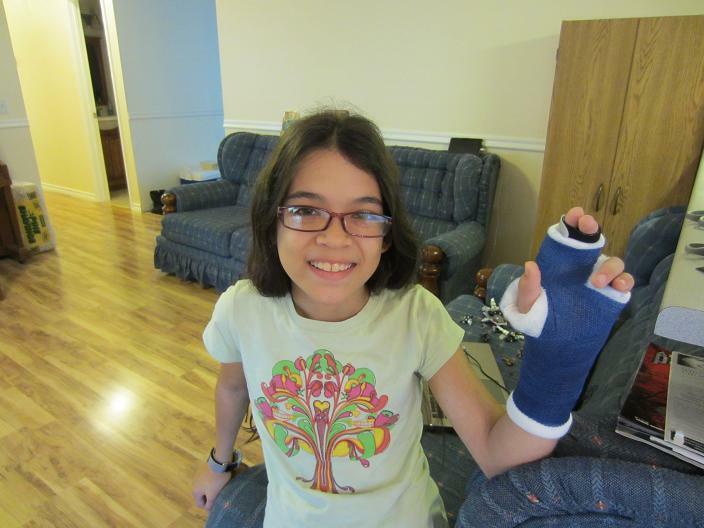 Although that’s not typically the type of record that you want to set, doesn’t she look proud of her cast? So, how did she break it? That’s actually kind of interesting; it appears that she was playing outside with Daniel. While pretending to be a lion, crawling on all fours, she stepped on her hand — resulting in a broken index finger. She says that it doesn’t hurt anymore, which is good. The cast will probably be taken off in a couple of weeks, and until then, she doesn’t seem to mind not having to wash her hand, not having to practice piano, getting helped with everything, and being allowed extra-large helpings of dessert. Yeah, I’m sure she’ll be just fine.